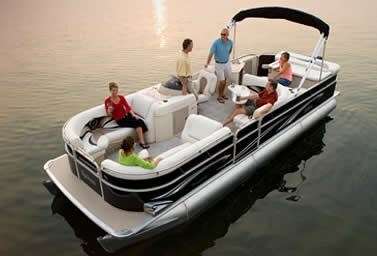 Docks with motors, floating patios, barges, old man powerboats, all nicknames for pontoon boats, and none flattering. Pontoon boats have always had a love/hate relationship with the general boating public. Those that don't like them can't see the need for them, and those that love them, speak passionately about them. They have come a long way since the 50's when Ambrose Weeres had the idea that if you took two steel drums and put a plank of wood in between them it would be more stable than a traditional powerboat... and he was right. Since then toons have had major job roles: work barge or party barge. For the sake of boaters, the party barge has also come a long way from an outboard motor attached to some plywood holding together a bunch of 45 gallon drums. These simple vessels were great ways for families to get out boating together. Kids and elderly requiring easy access and flat decks found pontoon boats stable and secure. Exciting colour options, canopies and built in seating has been the story for most of the 80's and 90's. There are many of these used pontoon boats for sale today, and if you look hard enough you can find the one that's right for you. But pontoons are about to start a new chapter. And what an exciting chapter it is. Pontoon boats are no longer the slow cottage cruiser you're used to seeing on your lake. 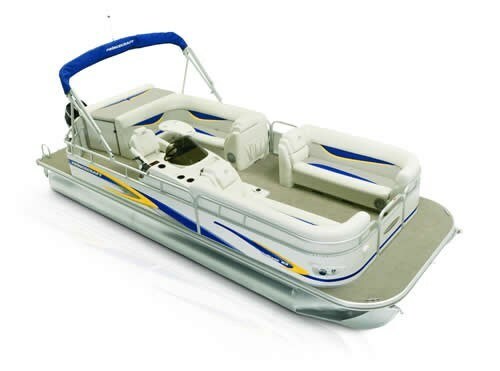 The high horsepower triple pontoon revolution of new pontoon boats for sale is here. It seems every company is trying to go bigger and faster than the next, but there is more to these than just high powered motors. While most companies are adding features like lifting strakes and full length keels to improve handling and ride characteristics, companies like Sylvan are redesigning the pontoon completely. Their RPT toon is round on the top like your traditional toon, but at the bottom is shaped like the V hull on a powerboat. This provides the lift and control you need, but also cuts the waves and water for a smoother ride. All of these companies have been experimenting for sometime now as well with triple toon configurations to improve stability with companies like Sweetwater making the center toon shorter and wider, Manitou boats lowers the center toon more than the others simulating a V hull. While companies are still making traditional 'toons, the high performance pontoon wave is upon us, and it's an exciting one. When looking for a new or used pontoon boat for sale, look for G3 Boats and Legend to keep it traditional, with companies like Princecraft, South Bay, Sylvan, Manitou and Sweetwater to keep pushing the envelope. Happy Cruising!